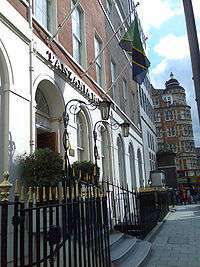 The Tanzanian High Commission in London. Tanzania and the United Kingdom are both members of the Commonwealth of Nations. An example was the island of Cyprus. Until 12 July 1878 Cyprus was under Ottoman rule based in Istanbul. From that date it was under British administration, but Istanbul retained nominal sovereignty until Cyprus was fully annexed by Britain on 5 November 1914. There were 9 successive High Commissioners, all but one already knighted, from 22 July 1878 until on 10 March 1925 Cyprus became a crown colony, and the last incumbent stayed on as its first Governor. The High Commissioners for Palestine and Transjordan, who administered Mandatory Palestine, had a considerable effect on the history of Zionism and the early stages of what would become the Israeli-Palestinian Conflict. A high commission could also be charged with the last phase of a decolonisation, as in the crown colony of the Seychelles, granted autonomy on 12 November 1970: the last governor, Colin Hamilton Allen (1921–1993) stayed on as the only colonial high commissioner from 1 October 1975, when self-rule under the Crown was granted, until 28 June 1976 when the Seychelles became an independent republic within the Commonwealth. As diplomatic residents (as diplomatic ranks were codified, this became a lower class than ambassadors and high commissioners) were sometimes appointed to native rulers, high commissioners could likewise be appointed as British agents of indirect rule upon native states. Thus high commissioners could be charged with managing diplomatic relations with native rulers and their states (analogous to the resident minister), and might have under them several resident commissioners or similar agents attached to each state. Southern Nigeria, three incumbents 1900–1906 (four terms), the last of whom stayed on as first governor. In certain regions of particular importance, a commissioner-general would be appointed, to have control over several high commissioners and governors, e.g. the commissioner-general for south-east Asia had responsibility for Malaya, Singapore and British Borneo. The role of High Commissioner for Southern Africa was coupled with that of British Governor of the Cape Colony in the 19th century, giving the colonial administrator responsibility both for administering British possessions and relating to neighbouring Boer settlements. The best known of these high commissioners, Alfred Milner who was appointed to both positions in the 1890s, is considered responsible by some for igniting the Second Boer War. Historically, in southern Africa, the protectorates of Bechuanaland (now Botswana), Basutoland (now Lesotho) and Swaziland were administered as High Commission Territories by the Governor-General of South Africa, who was also the British High Commissioner for Bechuanaland, Basutoland, and Swaziland, until the 1930s, with various local representatives, and subsequently by the British High Commissioner (from 1961 Ambassador) to South Africa, who was represented locally in each territory by a resident commissioner. The British Governor of the crown colony of the Straits Settlements, based in Singapore, doubled as High Commissioner of the Federated Malay States, and had authority over the Resident-General in Kuala Lumpur, who in turn was responsible for the various Residents appointed to the native rulers of the Malay states under British protection. The British Western Pacific Territories were permanently governed as a group of minor insular colonial territories, under one single part-time Western Pacific High Commissioner (1905–1953), an office attached first to the governorship of Fiji, and subsequently to that of the Solomon Islands. He was represented in each of the other islands units by a Resident Commissioner, Consul (representative) or other official (on tiny Pitcairn a mere Chief Magistrate). Currently there is still one high commissioner who also serves in an additional capacity as a governor: the British High Commissioner to New Zealand serves ex officio as British colonial Governor of the Pitcairn Islands. In the Kingdom of Denmark, High Commissioners (Danish: Rigsombudsmanden) represent the Government of Denmark in Greenland and the Faroe Islands (two self-governing regions of the kingdom) and take part in negotiations on policies and decisions affecting their region (including negotiations with the devolved legislatures and the Danish parliament). Greenland and the Faroe Islands have one Commissioner each. once Charles de Gaulle named someone else as High Commissioner for the French Territory of the Pacific and the Far East, January 1941 – 1945: Georges Thierry d'Argenlieu (b. 1889 – d. 1964), while in December 1941 the Vichy (pro-German) government named Jean Decoux (b. 1884 – d. 1963) to the post (who in fact was only responsible for Wallis and Futuna, which was the only Pacific territory not to have rallied to the Free French at that time). In the later period of decolonisation, the office of High Commissioner in a colony to become an allied nation was intended to become remarkably analogous to the Commonwealth's 'close relationship diplomats' in President General De Gaulle's project for a French Union to match the Commonwealth, but it soon started to fall apart, so they actually just presided over most of the peaceful decolonisation. Chad, since 27 October 1946 an overseas territory of France (part of AEF colony) under its own Governor, shortly after it was on 28 November 1958 granted autonomy as Republic of Chad, had a single High Commissioner from 22 January 1959: Daniel Marius Doustin (b. 1920) until its 11 August 1960 independence from France. In Senegal, since 27 October 1946 an overseas territory of France, which on 25 November 1958 had obtained autonomy (as Republic of Senegal), the last Governor stayed on as first (and only?) Haut commissaire 25 November 1958 – 20 June 1960: Pierre Auguste Michel Marie Lami (b. 1909); meanwhile on 4 April 1959 the Sudanese Republic (now Mali) and Senegal formed the Mali Federation and his term ended at the 20 June 1960 independence of that Mali Federation from France (on 20 August 1960 the Republic of Senegal withdrew from the thus dissolved Mali Federation). February 1959 – 5 August 1960 Paul Jean Marie Masson (b. 1920), till the Independence from France as the Republic of Upper Volta. Tunisia, known as the Régence (since 3 June 1955 autonomous), where France had a Resident-general (posted with the Basha bey of Tunis, who once the French protectorate was terminated on 20 March 1956 restyled his realm al-Mamlaka at-Tunisiyya 'Tunisian Kingdom'), instead got a High commissioner from 13 September 1955 to 20 March 1956: Roger Seydoux Fornier de Clausonne (b. 1908 – d. 1985); in continued shortly as independent monarchy, but on 25 July 1957 became the Tunisian Republic. Yet a colony could achieve independence without a High Commissioner, e.g. Guinée (French Guinea). In one case a French Haut Commissaire was the exact match and colleague of a British High Commissioner: they represented both powers in the south sea condominium (i.e. territory under joint sovereignty) of the New Hebrides, which became the present republic of Vanuatu. The current High Commissioner of Vanuatu to the US [5 February 2009] is David J. Wilson (born 1956). In New Caledonia (Nouvelle Calédonie in French, colonised in 1853; its Governors had been High Commissioners in the Pacific Ocean from 22 March 1907, see above) the title (commonly corrupted to Haussaire) was chosen for the chief executive on 19 December 1981, when it was an overseas territory (since 1946), even before autonomy was granted on 18 November 1984, and maintained after its status was changed on 20 July 1998 to the unique French collectivité sui generis; he represents the Paris government, while there are a native legislature and government. In early May 1919, the Kingdom of Greece was given a mandate by the Supreme Allied War Council for the city of Smyrna (Izmir) and its hinterland, which it proceeded to occupy on 12 May. A civilian administration was set up in the "Smyrna Zone", headed, from 21 May 1919 until 9 September 1922, when Greece lost Smyrna to Turkey, by the High Commissioner (Greek: Ὕπατος Ἁρμοστὴς) Aristeidis Stergiadis (1861–1950). The title Alto Comisario was also used for the representative of Spain in its protectorate zone within the Sherifan sultanate of Morocco (most of the country was under French protectorate), known as el Jalifato after the khalifa (Jalifa in Spanish), the Sultan's fully mandated, princely Viceroy in this protectorate, to which the High Commissioner was formally accredited, but whose senior he was in reality. In 1934–1956 the Governors of the Western Sahara (which from 27 November 1912 were also Governors-general of Spanish West Africa) were subordinated to him. The office itself was however filled by the governors of Spanish West Africa from 1939 to 1956. While being a US protectorate from 1905 to 1941, the Dominican Republic had first various native regimes, then US military Governors 29 November 1916 – 24 July 1922, and just before it again had the first of its own presidents on 21 October 1922, a single US High Commissioner, Sumner Welles, who served from 1922–1924. Haiti, the other (western) half of the island of Hispaniola, had a similar experience. It was a US protectorate from 1915 to 1936, after five US military commanders, there was one High Commissioner, John H. Russell, Jr., who served from 11 February 1922 to 16 November 1930. Following World War I, Rear Admiral Mark Lambert Bristol served as United States High Commissioner for Turkey from 1919 to 1927. 1935–1937 William Francis "Frank" Murphy, who was also the last Governor-General over the Islands. 1939 – 7 September 1942 Francis Bowes Sayers (exiled in the US from 24 December 1942 during the Japanese Occupation). 7 September 1942 – 4 July 1946 Paul V. McNutt (second commission; exiled in the US until August 1945 during the Japanese Occupation). Term ended when the Philippines achieved full sovereignty. 4 July 1957 – 1 May 1958 James Edward Moore. Moore was also the last Deputy governor and Commanding General, Ryukyu Islands Command. 1 May 1958 – 12 February 1961 Donald Prentice Booth. 16 February 1961 – 31 July 1964 Paul Wyatt Caraway. 1 August 1964 – 31 October 1966 Albert Watson II. 2 November 1966 – 28 January 1968 Ferdinand Thomas Unger. 28 January 1968 – 15 May 1972 James Benjamin Lampert. On 15 May 1972 Okinawa reverted to Japanese sovereignty as a prefecture; therefore, the office of US High Commissioner on Okinawa ceased to exist. In many cases, a political vacuum created by war, occupation or other events discontinuing a country's constitutional government has been filled by those able to do so, one nation or often an alliance, installing a transitional (often minimal) governance administered by, or under supervision of, one or more High Commissioners representing it/them. In Portugal, high commissioner (alto comissário in Portuguese) is the title of certain officials appointed by the President, the Parliament or the Government to deal with special matters of national importance (e.g. : the High Commissioner for Immigration and Intercultural Dialogue is the government official responsible for the immigration and ethnic minorities affairs). Following the capitulation of the Ottoman Empire in the Armistice of Mudros, on 8 December 1918 the Allies occupied the shores of the Bosporus, the Dardanelles, the eastern coast of the Sea of Marmara up to 15 km deep, the islands of Imbros, Lemnos, Samothrace and Tenedos. The entire area demilitarised (Zone of the Straits). This was complemented in 16 March – 10 August 1920 as the allies occupied the Ottoman capital Constantinople (Istanbul). Until the termination of Allied occupation on 22 October 1923, there were at all times one British Senior Allied High Commissioner and one (junior) Allied High Commissioner (incumbents from France, thrice, Italy and the US, each twice). As the 'world community' became a widely accepted ideal in diplomacy and was embodied first in the League of Nations and later the United Nations, these often came to play a key role in extraordinary situations that would earlier probably have been dealt with by states as above, sometimes reflected in the appointment of High Commissioners under their auspices, sometimes just from the same leading powers, sometimes rather from 'neutral' member states. The title of High Commissioner was specifically used for the administrators during the 'emancipation from colonial rule' of League of Nations mandates and United Nations Trust Territories, i.e. non-sovereign states under a 'transitional' regime established under the authority of the League of Nations or the UN, respectively, to prepare them for full independence. These 'guardianships' most often were simply awarded to the former colonial power or if that was a loser in the preceding World War, to the 'liberating' Allied victor(s). The trust territories have all now attained self-government or independence, either as separate nations or by joining neighbouring independent countries. June 1957 – 27 April 1960 Georges Léon Spénale (b. 1913 – d. 1983); next it was an independent republic. The UN Trust Territory of the Pacific Islands (originally comprising Marshall Islands, Micronesia, Northern Mariana Islands and Palau), after Allied military occupations, since 18 July 1947, had a dozen high commissioners, also presiding over the splitting off of Palau and Marshall Islands in 1980 and the 10 May 1979 granting of autonomy to the Federated States of Micronesia (former Ponape, Truk and Yap districts of the Trust Territory) until on 3 November 1986 the Trust Territory was dissolved by the US (a single Director of the Office of Transition, Charles Jordan, stepped in from 3 November 1986 – 30 September 1991, a while after the 22 December 1990 proclamation of final independence as the UN Security Council ratified the termination of US trusteeship). After the former Italian colony of Eritrea had been under victor Britain's administration since 5 May 1941, a specific United Nations administration, under Britain, was installed on 19 February 1951, under a UN High Commissioner, Edoardo Anze Matienzo (Bolivian, b. 1902), whose office ceased on 15 September 1952 when it was Federated with Ethiopia under the sovereignty of the Ethiopian emperor. At the United Nations and affiliated global organisations, a High Commissioner serves as the permanent chief executive of a commission composed of representatives of various member nations. the UN High Commissioner for Human Rights, who has the rank of Under-secretary-general, serves the United Nations Human Rights Commission. In fact in 2005, the US Ambassador at the UN complained that the incumbent, as a 'civil servant', was not authorised to act upon information (in this case worldwide press reports on abnormal detention forms in the 'war against terrorism' suspected to breech the rights of the suspects) not obtained by the organisation's official channels.